Midwest utility Exelon Generation recently completed construction of the largest urban solar power plant in the U.S.-the 10 MW Exelon City Solar project-on a 41-acre brownfield site in Chicago. With Chicago being the "Windy City", it made sense that utility company Exelon looked there to build a wind power project. The company was looking for renewable energy projects that would complement and support its Exelon 2020 initiative-to displace the company's entire carbon footprint by the year 2020. Unfortunately, the research revealed the best place to harvest wind was along the shores of Lake Michigan on Lake Shore Drive. Assuming the city wouldn't find it aesthetically pleasing, the project was dropped. 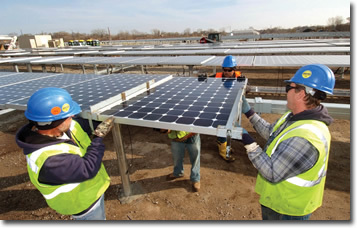 Soon after, in February 2009, new incentives became available and this time, Exelon focused on a solar energy project. "We took the idea up to senior management, did our economic analysis, and met with the City," says John Murphy, senior project manager with Exelon Generation. "We also interviewed contractors and found that SunPower had the most efficient system." "SunPower's tracker technology physically rotates the panels over the course of the day to follow the movement of the sun," added Exelon spokesperson, Paul Elsberg. "You get maximum exposure on the panels throughout the daylight hours, and that helps us generate more electricity per hour, which improves the economics of the plan." Since this particular solar farm would be in the middle of the city, in a small, controlled environment, efficiency was key. Exelon partnered with SunPower and asked them to come with them to do analysis on site selection, "because it doesn't matter how much sun you get, as long as you get enough to be profitable," says Murphy. Murphy and his team worked with Chicago's Community Development Council (CDC) to find the best location. "They were terrific to work with," says Murphy. "They were motivated, they had properties throughout the city that were vacant and weren't collecting any revenue on them, and it's the CDC's responsibility to get those properties back on to the payroll." A 41-acre site on the South Side of Chicago, formerly the home of International Harvester in the 1960s, met everyone's needs. It was vacant and large enough to give Exelon the economy of scale required for a 10-megawatt solar farm. 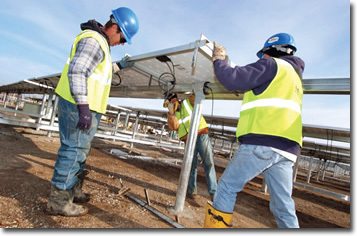 Before the 32,292 solar photovoltaic panels could be installed, the site required some work. "Whenever you're taking on a brownfield site, you don't know what's going to be there," says Murphy. "Environmental standards today, versus what they were almost 40 years ago, have changed dramatically. We found underground storage tanks, some still full of oil that could have deteriorated further and gotten into the ground water. We disposed of them properly, and that made the site even safer than it was." A total of 32,292 solar photovoltaic panels were installed on the 41-acre site on the South Side of Chicago. 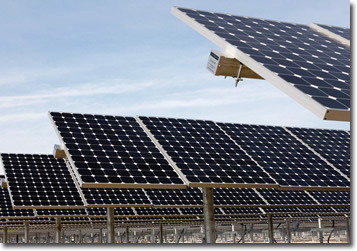 The site was large enough to give Exelon the economy of scale required for the 10-megawatt solar farm. The neighborhood just across the street from the brownfield site had been actively pursuing the City to get the property developed. It was not only an eyesore, it was also a hazard for children, with exposed basements that filled with water. The families wanted the new owners to address their concerns. "They wanted to know things like, "Will there be a lot of traffic?" and "Will it emit any chemicals or hazardous materials?" says Elsberg. "Not only were the answers to those questions 'no', part of the motivation for building this project was that the electricity it generated would actually displace the electricity produced at power plants that burn fossil fuels to generate electricity. Not only would it make the local community safer and cleaner, but it would make the electric system cleaner." In addition to creating cleaner energy and a safer neighborhood environment, when it came time for construction, Exelon looked to the Chicago neighborhoods. Of the 200 people employed during construction of the project, more than 50 percent came from the city. "We also sourced construction materials for the facility locally," says Elsberg. "The steel piers that create the support system for the panels were sourced from a company that's less than a mile away." Construction began in August 2009, and by December 31, 82 percent of the electricity was being generated. By January, it was up to 100 percent. It was completed on time and also five percent under budget. Murphy credits much of this to the management model when Exelon partnered with SunPower. "Not only did we have a fixed price, turn-key project for SunPower, we also signed a 25-year agreement with them to operate and maintain the facility. It was incumbent upon them to build a good product, because they knew they were going to have to be responsible for operating it. That was a great strategic move on our part." Another benefit to building the solar farm in the city center was that interconnection was curbside ready. "If we had built this in the middle of nowhere, we would have had to run miles of transmission lines," says Murphy. "Being in the middle of the city, we were able to make our interconnection with the ComEd (Commonwealth Edison) lines on the property. And we paid ComEd to string the lines under the ground so it posed no threat to the public and was aesthetically pleasing." ComEd is a subsidiary of Exelon Corp. and supplies electric service to more than three million customers in the Chicago area. The close relationship between the two companies didn't alter the process. Exelon was treated like any other customer and received no special treatment. "That means anyone can do what we did," says Murphy. "There has been a lot of interest from other small businesses that wanted to know how they can do what we did. It's pretty textbook. Even a homeowner could do it. A meter shows how much electricity is generated, and you're paid based on what's on the meter." This $60 million project is a demonstration facility, in that it's the first project Exelon has ever owned. If it proves profitable, more may be built. "We're going to do what's in the best interest of the shareholders," says Elsberg. When it came to construction help, Exelon Generation looked to the Chicago neighborhoods. Of the 200 people employed during construction of the project, more than 50 percent came from the city. Profits, however, may be further in the future. Exelon had hoped to obtain a loan guarantee under the stimulus package, but since they didn't receive it, "profitability is now going to be dictated by the marketplace," says Murphy. "Prices are set based on the margin generator-and that's natural gas. If the price of natural gas goes up over the next 25 years-the minimum life span of the plant-then we'll reach profitability that much sooner." For the immediate future, Exelon will take a wait and see approach. "I think it's fair to say, though, that if you look at the industry at large, certainly you'll see increased investment in solar power in the coming years, especially as we see the price of panels continue to decrease," says Elsberg. Buy in. Not from most, but ALL key stakeholders. A city and community with a vested interest in developing green energy projects. Chicago has its own climate change plan to reduce greenhouse gases, and Exelon was able to demonstrate how its project could help them execute that plan. Solid Numbers. "You have to understand your economics, including your Purchase Power Agreement and your solar renewable energy credits," says Murphy. Incentives. "You also need to know what incentives are available. This project took advantage of a variety of tax credits and benefits," adds Elsberg. Though it's not known as a solar hub, one of the largest solar markets in the U.S. is New Jersey, because of its financial incentives. Company motivation. Exelon 2020 was the impetus for this project. "It's a far-reaching, comprehensive plan that touches every piece of our business," explains Elsberg. "Being the least carbon-intensive major utility in the country, we're actually capable of achieving that goal. One piece of our strategy is to introduce more low-carbon electricity into the marketplace, and that includes increased investment in renewable sources like solar." Murphy adds, "We are talking about leading by example. This project started with our CEO, John Rowe. Without his involvement, this project would not have moved forward at all, but he pushed for it. And also, he's been very vocal about the need for controlling greenhouse gases." In the meantime, both Murphy and Elsberg are proud of the safety hazards that were removed as a result of the project, as well as the landmark this has given the community. "Hopefully, the community can build on it, because as you fly into Midway Airport, 41 acres of solar panels is really a pretty sight to see. I think it's going to end up putting this neighborhood on the map. It's already created a lot of positive buzz in the neighborhood. It's something they can build upon to draw in business."